1 to 1 support to help you build a better business. Like any building project, before you start building your business you need a plan. 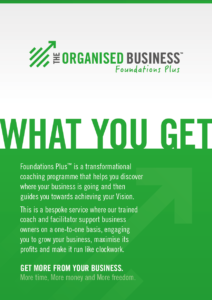 Foundations Plus™ is a bespoke service where our trained coach and facilitator support business owners at their own premises on a one-to-one basis, engaging with them to grow their businesses, maximise its profits and make it run like clockwork. What does Foundations Plus™ achieve? The plan will prioritise the areas of your business that need to be built on in a logical order to help you to grow your business in an organised way. We will support you to turn the plan into real actions. Foundations Plus™ is for small business owners that want to grow their business. 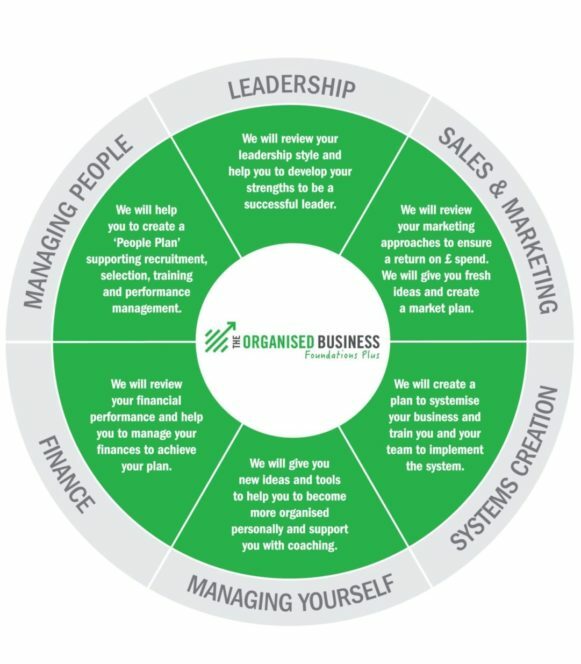 Business owners that understand that their business needs to be organised to be successful, but that are too busy working in their business to focus on making the changes needed. It is for those that know that they will need a more structured, personal approach to ensure that they take time out of working in their business to working on their business, with someone helping them each step of the way to achieve their vision. We will start to develop your plan through a facilitated Foundation Plus Discovery Day™ with one of our Business Architects™. This is an in-depth day, taking you out of your business and looking at it with a fresh pair of eyes to review where both you and your business are now and where you really would like to be in the future. Your facilitator will then consider and review the outcomes of the day and present them as a structured business plan for agreement. The Foundations Plus Discovery Day™ is followed by regular blueprint meetings™ that are designed to keep you on track to achieve your business plan. In each of the blueprint meetings™, not only will we challenge and support you to achieve your vision and plan, you will also be given coaching to help you improve your self-management and develop your leadership style. Our facilitator will also give training to you and your team in key skills that you need them to have in order to help you to grow your business in areas such as sales and marketing, finance and systems. Long-term support is also available through on-line support and our simple How-to-Guides. Please contact us if you would like more information or download our what you get booklet.